The feds didn’t get their way with our lever-actions, despite two attempts to get the states to agree to reclassifying them to either B or D.
They will try a third time. If 1996 is to repeat itself, the feds will look at “other options” to get their way. This is not just conjecture: in 1996 the Howard Government received a brief on what powers it had to get its way if the states didn’t roll-over on semi-autos. One year earlier, the police minister’s conference agreed to address a number of new firearm laws. This was led by a working party convened by our own brethren, Victoria. Without going too deeply into the details (as it relates to a number of tricky constitutional issues), the advice received by the government identified seven ways to get our semi-autos (with thanks to Bruce Gordon who helped me with this information). 1. Prohibit the importation of certain firearms: This is because the Commonwealth controls our external borders. 2. Have the states ‘refer’ their powers to the Commonwealth: This is, as the phrase suggests, a handballing of responsibility of firearm laws to the feds. Then NSW Premier, Bob Carr, started the process by introducing legislation in his state’s parliament, however achieving a referral would have required the other states to follow suit, which they did not. 3. Prohibit sending firearms, ammo and related items through the postal system: Again, because the feds control that network. 4. Give effect to an international treaty banning certain firearms: Possible, but it’s doubtful any country would be so stupid to agree with a crazy idea like banning lever-actions. 5. 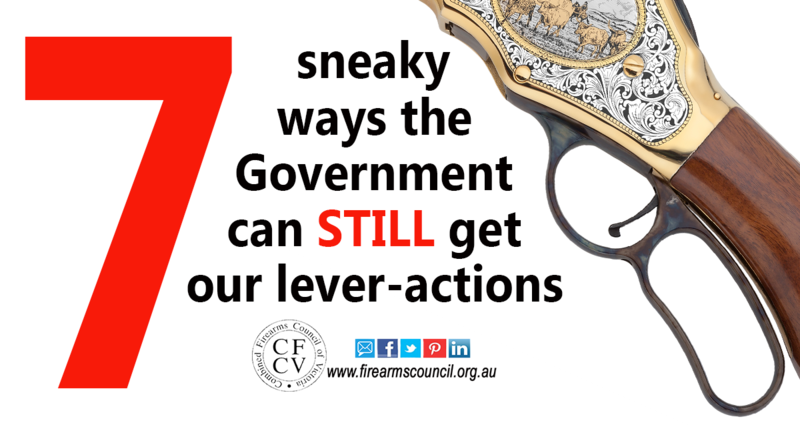 Ban our lever-actions in the ACT and Northern Territory: The feds could do this now, but we’d then have a National Firearms Disagreement. 6. Provide grants to the States with terms and conditions attached to them: In other words, bribery. 7. Tax the living daylights out of firearms and ammo: Fortunately the power to tax cannot be used as imposing a penalty – but they could try. Those are the measures Howard was briefed on, if he wasn’t able to get the states to agree to his plan. Don’t think for one minute that our bruised and battered public servants haven’t given up. Last week’s vote was close – too close for comfort. Who said the power to tax cannot be used as a penalty? Tobacco, alcohol, petrol – people only started owning and driving cars well after World War 2 – we may see the day when ordinary people can no longer afford to drive – if you can’t afford to drink and smoke – driving will be next. That estimate would be about right. Also, the CFCV does harness the shooting vote, with direct mailouts to members of our organisations in key electorates, staffing polling booths and providing funding assistance to the right candidates and political parties. We provide well considered how-to-vote recommendations and are using Facebook to try and spread that message to the 150k + shooters in Vic who aren’t a member of any shooting organisation, but matter in this equation. If you want to hear more, you can attend our industry-wide forum in April. Email [email protected] if interested. Love your work team! Would be great to see it happen nationwide.